Sen. Tom Harkin4 speaks to reporters after a vote on Capitol Hill in Washington in this December 17, 2012 file photograph. America’s 3.6 million minimum-wage workers will get a nearly 40 percent pay raise, if Sen. Tom Harkin, D-Iowa, has his way. A few weeks after President Barack Obama touted a minimum wage increase to $9.00 in his State of the Union speech, the veteran senator introduced a plan to go even further, raising the low end of legal earnings from $7.25 to $10.10. 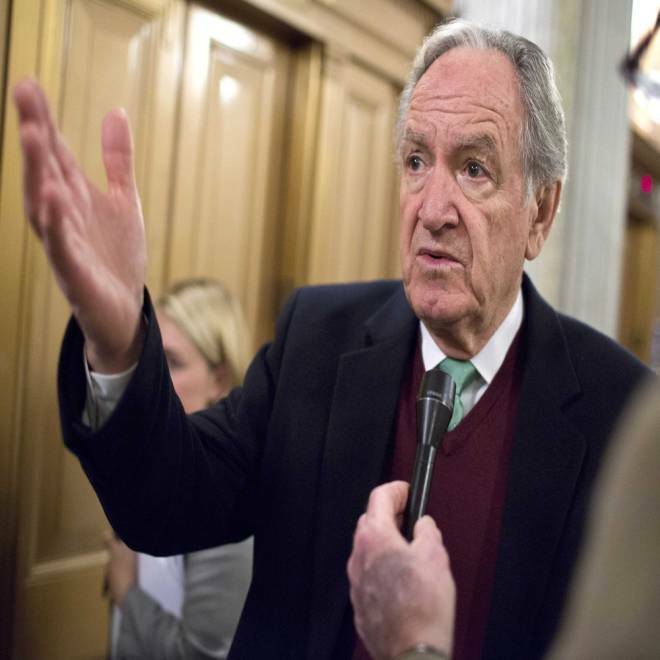 For a person working 40 hours a week and 52 weeks a year, Harkin's bill would mean an increase of $5,928. "[E]mployment is starting to go up, and we just don’t want minimum wage workers left behind and left out of this recovery," the Iowa Democrat said. More than 70 percent of the American public favors raising the minimum wage, according to a recent Gallup poll, but Harkin's proposal faces an uncertain path to becoming law. It’s difficult to imagine a scenario in which congressional Republicans would agree to Harkin’s bill. They generally believe that raising the minimum wage would lead to layoffs at the low end of the wage scale, hurting, not helping workers. But perhaps if wrapped into a larger deal on entitlements and taxes, an increase might get enacted. Workers at or below the minimum wage accounted for 4.7 percent of hourly-paid workers and about 2.5 percent of all workers last year, according to the Bureau of Labor Statistics. Roughly half were 25 or older, nearly two-thirds were working part time, and less than three-fourths had graduated from high school, according to recent government data. Leading the opposition to a minimum wage increase is the National Restaurant Association. At a hearing last week of the Senate Health, Education, Labor and Pensions (HELP) Committee, which Harkin chairs, David Rutigliano, a partner in a Connecticut restaurant chain and a member of the Connecticut Restaurant Association, argued that "at a time when many businesses are struggling to keep their doors open and in some cases employers are foregoing their own paychecks to avoid laying off employees, mandating wage increases will only hurt those employees which this proposal seeks to help." But another witness at the hearing, Oregon Commissioner of Labor and Industries Brad Avakian, countered that raising the minimum wage would be good for the economy. "Increasing workers’ purchasing power leads to a healthier economy. Virtually every dime that comes through a higher minimum wage is reinvested in the local economy when the worker buys groceries, gas, clothes, school supplies and other essentials," he said. Oregon pegs its minimum wage to the Consumer Price Index, which means it usually goes up slightly each year. Differing studies of the minimum wage are cited by advocates on the opposing sides of the debate. Harkin is referring to 1992 and 1994 studies by economists Alan Krueger and David Card. Krueger, on leave from Princeton University, is now head of Obama’s Council of Economic Advisors. In 2007, President George W. Bush signed into law the most recent increase in the federal minimum wage, bringing it to $7.25 an hour by 2009 (some states have higher minimums). Harkin's proposal would increase the minimum wage to $10.10, in three steps, and then index it to the Consumer Price Index starting three years after enactment. Defending Obama's lower proposed increase, Obama economic adviser Jason Furman said last month that “$9.00 an hour is a robust increase in the minimum wage and would put it at a higher level adjusted for inflation than any time since 1981.” Furman also said that refundable tax credits, which are essentially cash payments from the federal government to workers, when combined with a higher minimum wage, would lift low-wage workers above the federal poverty line. As the recession hit in 2008, 2009 and 2010, Bush, Obama, and Congress used refundable tax credits to boost income for low-wage workers. Harkin said refundable tax credits aren't as useful to workers because they are only paid periodically, while an increase in the minimum wage is paid every time a worker deposits or cashes a paycheck. “Most people who are at that level pretty much live from paycheck to paycheck, so that’s why refundable tax credits don’t necessarily do the job,” he said. “The way to help the 12 million unemployed workers in America is not to put a new tax or cost on employers that will cause them to reduce the number of jobs which this (Harkin’s proposal) will do,” said Sen. Lamar Alexander, R- Tenn., the top Republican on Harkin’s HELP Committee.